Description: No3. Steel Slicer With Wooden Handle used for slicing vegetables and meat. Simply enter your details below and we will send you an e-mail when “No3. 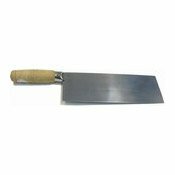 Steel Slicer With Wooden Handle (木柄小片肉刀 (小))” is back in stock!